At a little design-and-craft studio that built into family house space, Zeina El-Shazly is hard at work with her pliers, beading needle and wire cutters to produce a bunch of earings, rings and bracelets that are to be put on display on the Facebook account of her online accessories making service: Zee Accessories. The items that Zeina is producing for the coming weeks are mostly made of simple designs in which she brings together colourful beads with silver and copper charms that are mostly inspired by the Egyptian folk culture like Kaf Fatima (the full-stretched palm) or the blue round eye-shaped stone, both of which are meant to ward off the evil eye. “These are the extension of the production I have been working on since the summer of 2012 – an assembly of items that are essentially inspired by the mix of colours of beads and stones that I often like to use,” El-Shazly said. Those, she said, would be available for clients who are interested in an online Christmas shopping experience. But by the spring of next year, ElShazly is planning to put out her first collection that she promises would take her rings and bracelets to a new horizon. “It would not be sporadic designs but a theme that I would develop into several items; it would be in copper essentially but also in silver,” she said. Copper, El-Shazly explained, is a metal that is gaining ground –- not just with new designers and crafters but also with clients. “The very simple fact is that it is quite less expensive than silver and it does mold into beautiful shapes of accessories,” she suggested. Throughout her close to five years in a slowly growing business, “which really started off as a childhood hobby that was bravely encouraged by my mother," this designer-crafter has been seeing a growing interest in “beautiful but not so expensive jewelry items – it is the growing world of accessories." At 24 years of age, and with a job as a psychologist in a leading hospital, El-Shazly is not short on energy or passion to advance her small online business. 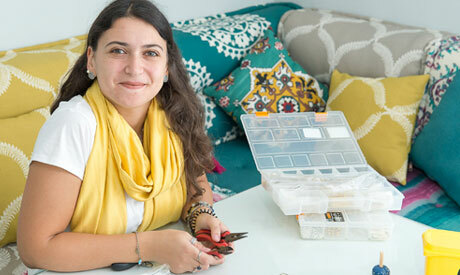 Having absorbed the pick-and-go experience while walking around the workshops in the alleys of Old Cairo where she had put hands on her first pliers a few years ago, El-Shazly finished a metalsmithing and jewelry-making course this year at the Azza Fahmy School. Like other graduates of this school, El-Shazly is fully inspired but is firmly determined to innovate and never to imitate. “I guess one thing that has happened in the business of accessories and jewelry making is that there was a bit of laxity to find new inspiration; there were a few successful models offered and then they become too easily imitated,” El-Shazly said. She added that part of the contribution that young and aspiring designers and crafters could offer is to find a new inspiration and to explore with some daring art ideas -– “because otherwise it becomes all one in the same, and this would be boring." It was the genuine want of the new and different lines that had helped ElShazly, as she thinks today, in earning her first items a warm welcome in the few open houses and bazaars to which she has contributed. And it was this positive reaction to her work that added enthusiasm to passion and prompted her to do her online business while still studying psychology at St. Andrews University in Scotland. 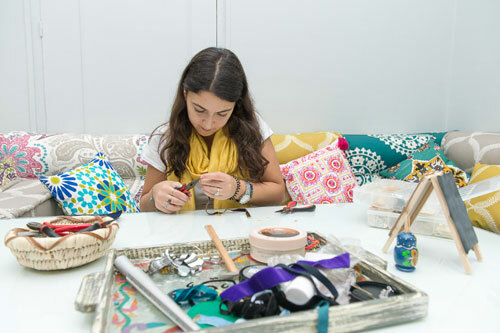 For El-Shazly, what brings psychology and crafts together is nothing but the passion for the “unhindered” –- because for her, souls and designs are meant to be free and rejoicing. And with a growing number of online jewelry options, El-Shazly said, what really makes one designer stand out is their ability to find new inspiration, so that a potential client scrolling through the many pages can find something captivating on one particular page.